• Easy plug and play installation -OE Harley plugs attached for the headlight and passing/aux lights. • Increased Safety - See over twice as far as stock lights. Other drivers can also you twice as far away. • Drop in replacement for standard h6024 7" headlight used on most bikes. • Comes with chrome plated ring for nacelle type Harley buckets - touring style bikes need the ring for installation. U.S. Department of Transportation( DOT) approval,legal on the road,one year quality warranty make sure you get best and risk-free lights! 3600LM High Beam, 2400LM Low beam for 7 Inch led headlight; 1440LM for 4.5 inch passing light, double brightness than stock light, good and safe for driving! Increased Safet - Adapter Ring reduces vibration and creates french look.Shake-proof,water-proof,dust-proof. 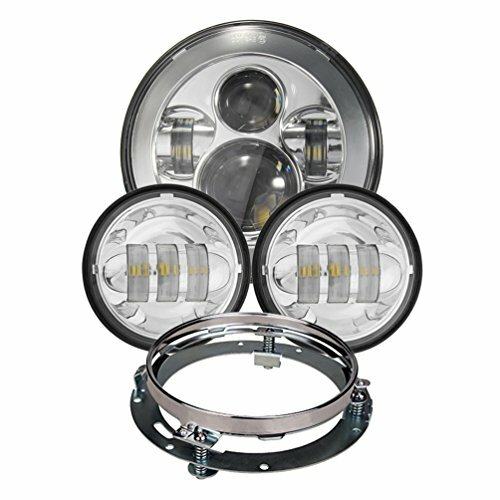 Fit any harley bikes with 7inch headlight and 4.5inch fog passing light,such as 2012-2017 Harley Davidson FLD; 1994-later Softail models equipped with Freight Train Headlamp Nacelle Kit; 1994-2017 Touring,include Road King,Road Glide, Street Glide and Electra Glide models;.2006-2010 FLHTCUSE models require separate purchase of wiring harness. Package include:1 pcs chrome 7 inch led headlight+2 pcs chrome 4.5 inch fog lights+1 pcs 7 inch chrome adapter ring+ 1pcs wire adapter for headlight(our lights kit will fit well to any harley bike with 7inch headlight and 4.5inch fog lights,no need to extra parts). If you have any questions about this product by LX-LIGHT, contact us by completing and submitting the form below. If you are looking for a specif part number, please include it with your message.